This document describes how to deploy Red Hat OpenStack Platform 14 with the OpenDaylight software-defined network (SDN) controller. The OpenDaylight controller is a drop-in replacement for the neutron ML2/OVS plug-in and for the L2 and L3 agents, and provides network virtualization within the Red Hat OpenStack environment. The OpenDaylight platform is a programmable SDN controller written in Java that you can use for network virtualization for OpenStack environments. The controller architecture consists of separated northbound and southbound interfaces. For OpenStack integration purposes, the main northbound interface uses the NeutronNorthbound project, which communicates with neutron, the OpenStack Networking service. The southbound OpenDaylight projects, the OVSDB and the OpenFlow plug-ins, are used to communicate with the Open vSwitch (OVS) control and the data plane. The main OpenDaylight project that translates the neutron configuration into network virtualization is the NetVirt project. The neutron reference architecture uses a series of agents to manage networks within OpenStack. These agents are provided to neutron as different plug-ins. The core plug-ins are used to manage the Layer 2 overlay technologies and data plane types. The service plug-ins are used to manage network operations for Layer 3 or higher in the OSI model, such as firewall, DHCP, routing and NAT. By default, Red Hat OpenStack Platform uses the Modular Layer 2 (ML2) core plug-in with the OVS mechanism driver, that provides an agent to configure OVS on each Compute and Controller node. The service plug-ins, the DHCP agent, the metadata agent, along with the L3 agent, run on controllers. OpenDaylight integrates with the ML2 core plug-in by providing its own driver called networking-odl. This eliminates the need to use the OVS agent on every node. OpenDaylight can program each OVS instance across the environment directly, without needing any agents on individual nodes. For Layer 3 services, neutron is configured to use the OpenDaylight L3 plug-in. This approach reduces the number of agents on multiple nodes that handle routing and network address translation (NAT), because OpenDaylight can handle the distributed virtual routing functionality by programming the data plane directly. The neutron DHCP and metadata agents are still used for managing DHCP and metadata (cloud-init) requests. OpenDaylight provides DHCP services. However, when deploying the current Red Hat OpenStack Platform director architecture, using the neutron DHCP agent provides High Availability (HA) and support for the virtual machine (VM) instance metadata (cloud-init), and therefore Red Hat recommends you deploy the neutron DHCP agent rather than rely on OpenDaylight for such functionality. The Red Hat OpenStack Platform director is a toolset for installing and managing a complete OpenStack environment. It is primarily based on the OpenStack TripleO (OpenStack-On-OpenStack) project. The project uses OpenStack components to install a fully operational OpenStack environment. It also includes new OpenStack components that provision and control bare metal systems to operate as OpenStack nodes. With this approach, you can install a complete Red Hat OpenStack Platform environment that is both lean and robust. The Red Hat OpenStack Platform director uses two main concepts: an undercloud and an overcloud. The undercloud installs and configures the overcloud. 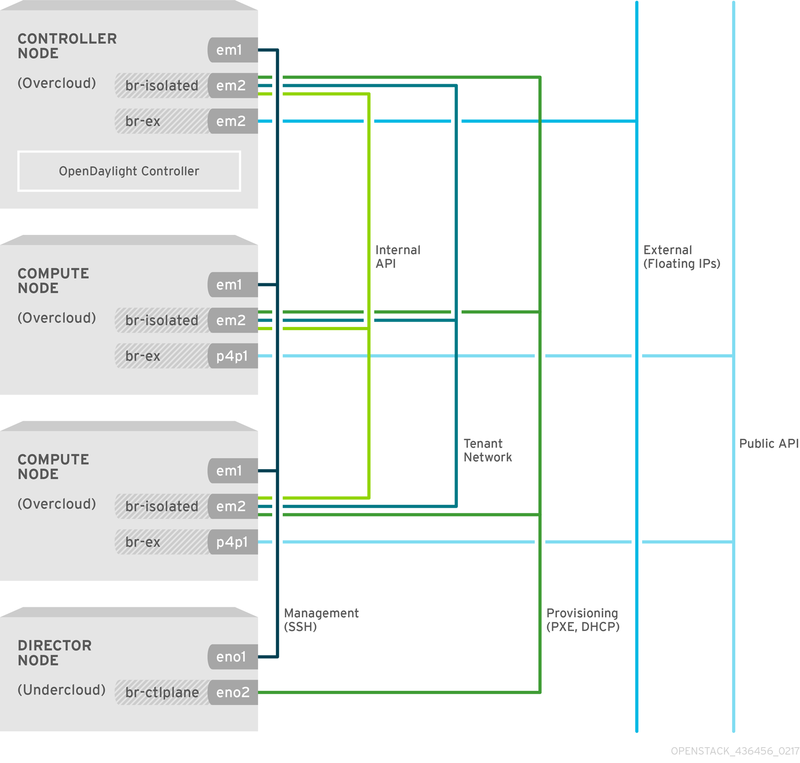 For more information about the Red Hat OpenStack Platform director architecture, see Director Installation and Usage. Red Hat OpenStack Platform director introduces the concept of composable services and custom roles. Composable services form isolated resources, that can be included and enabled per role, when they are needed. Custom roles enable users to create their own roles, independent from the default Controller and Compute roles. Users now have the option to choose which OpenStack services they will deploy, and which node will host them. The OpenDaylightOvs service for configuring OVS on each node to properly communicate with OpenDaylight. By default, the OpenDaylightApi service runs on the Controller role, while the OpenDaylightOvs service runs on Controller and Compute roles. OpenDaylight offers High Availability (HA) by scaling the number of OpenDaylightApi service instances. By default, scaling the number of Controllers to three or more automatically enables HA. For more information on the OpenDaylight HA architecture, see High Availability and Clustering with OpenDaylight. The power management network for nodes. You must configure this network before you install the undercloud. The director uses this network traffic type to deploy new nodes over the DHCP and PXE boot and orchestrates the installation of OpenStack Platform on the overcloud bare metal servers. You must configure the network before you install the undercloud. Alternatively, operating system images can be deployed directly by ironic. In that case, the PXE boot is not necessary. The Internal API network is used for communication between the OpenStack services using API communication, RPC messages, and database communication, as well as for internal communication behind the load balancer. neutron provides each tenant with their own networks using either VLANs (where each tenant network is a network VLAN), or overlay tunnels. Network traffic is isolated within each tenant network. If tunnelling is used, multiple tenant networks can use the same IP address range without any conflicts. While both Generic Routing Encapsulation (GRE) and Virtual eXtensible Local Area Network (VXLAN) are available in the codebase, VXLAN is the recommended tunneling protocol to use with OpenDaylight. VXLAN is defined in RFC 7348. The rest of this document is focused on VXLAN whenever tunneling is used. Block Storage, NFS, iSCSI, and others. Ideally, this would be isolated to an entirely separate switch fabric for performance optimization. OpenStack Object Storage (swift) uses this network to synchronize data objects between participating the replica nodes. The proxy service acts as an intermediary interface between user requests and the underlying storage layer. The proxy receives incoming requests and locates the necessary replica to retrieve the requested data. Services that use a Ceph back-end connect over the Storage Management Network, because they do not interact with Ceph directly but rather use the front-end service. Note that the RBD driver is an exception, as this traffic connects directly to Ceph. This API hosts the OpenStack Dashboard (horizon) for graphical system management, the public APIs for OpenStack services, and performs SNAT for incoming traffic going to the instances. If the external network uses private IP addresses (as per RFC-1918), then further NAT must be performed for any traffic coming in from the internet. Allows incoming traffic to reach instances using one-to-one IPv4 address mapping between the floating IP address and the fixed IP address, assigned to the instance in the tenant network. A common configuration is to combine the external and the floating IPs network instead of maintaining a separate one. Provides access for system administration functions such as SSH access, DNS traffic, and NTP traffic. This network also acts as a gateway for nodes that are not controllers. In a typical Red Hat OpenStack Platform installation, the number of network types often exceeds the number of physical network links. In order to connect all the networks to the proper hosts, the overcloud may use the 802.1q VLAN tagging to deliver more than one network per interface. Most of the networks are isolated subnets but some require a Layer 3 gateway to provide routing for Internet access or infrastructure network connectivity. For OpenDaylight, the relevant networks include Internal API and Tenant services that are mapped to each network inside of the ServiceNetMap. By default, the ServiceNetMap maps the OpenDaylightApi network to the Internal API network. This configuration means that northbound traffic to neutron as well as southbound traffic to OVS are isolated to the Internal API network. 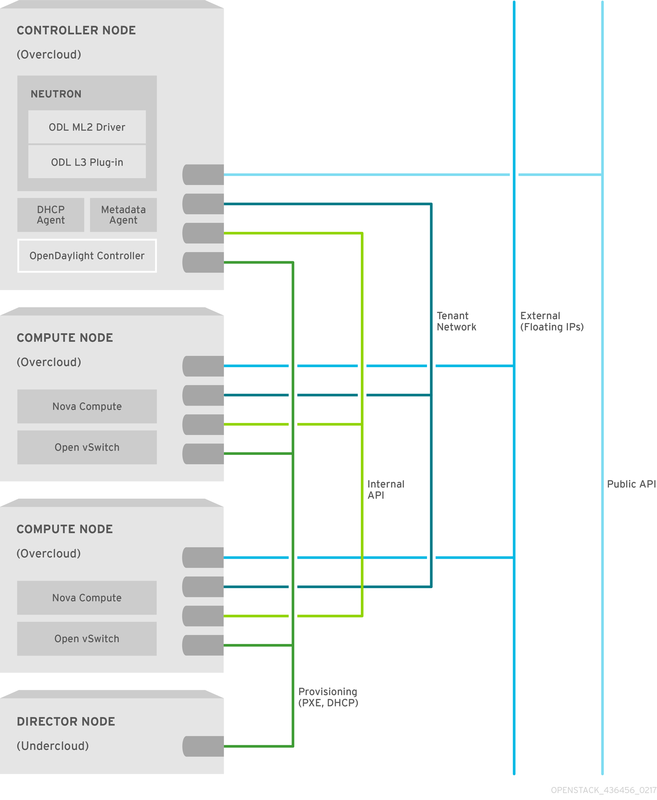 As OpenDaylight uses a distributed routing architecture, each Compute node should be connected to the Floating IP network. By default, Red Hat OpenStack Platform director assumes that the External network will run on the physical neutron network datacentre, which is mapped to the OVS bridge br-ex. Therefore, you must include the br-ex bridge in the default configuration of the Compute node NIC templates. On some deployments, such as those where restrictive firewalls are in place, you might need to configure the firewall manually to enable OpenStack and OpenDaylight service traffic. By default, OpenDaylight Northbound uses the 8080 port. In order not to conflict with the swift service, that also uses the 8080 port, the OpenDaylight ports are set to 8081 when installed with Red Hat OpenStack Platform director. The Southbound, in Red Hat OpenDaylight solution, is configured to listen on ports 6640 and 6653, that the OVS instances usually connect to. In OpenStack, each service typically has its own virtual IP address (VIP) and OpenDaylight behaves the same way. HAProxy is configured to open the 8081 port to the public and control the plane’s VIPs that are already present in OpenStack. The VIP and the port are presented to the ML2 plug-in and neutron sends all communication through it. The OVS instances connect directly to the physical IP of the node where OpenDaylight is running for Southbound. This section focuses on the services and protocols relevant to the OpenDaylight integration and is not exhaustive. For a complete list of network ports required for services running on Red Hat OpenStack, see the Firewall Rules for Red Hat OpenStack Platform guide. Chapter 2. What do you need to run OpenDaylight? The following section contains information about the deployment requirements for the overcloud with OpenDaylight. You must have sufficient computer resources available to correctly install and run Red Hat OpenDaylight. Use the following information to understand the minimum requirements. Compute nodes are responsible for running virtual machine instances after they are launched. All Compute nodes must support hardware virtualization. They must also have sufficient memory and disk space to support the requirements of the virtual machine instances that they host. 64-bit processor with support for the Intel 64 or AMD64 CPU extensions, and the AMD-V or Intel VT hardware virtualization extensions enabled. It is recommended that this processor has a minimum of 4 cores. A minimum of 6 GB of RAM. Add additional RAM to this requirement according to the amount of memory that you intend to make available to virtual machine instances. A minimum of 40 GB of available disk space. A minimum of one 1 Gbps Network Interface Cards, although it is recommended to use at least two Network Interface Cards (NICs) in a production environment. Use additional network interface cards for bonded interfaces or to delegate tagged VLAN traffic. For more information about NICs, see Tested NICs. Each Controller node requires a supported power management interface, such as an Intelligent Platform Management Interface (IPMI) functionality, on the server’s motherboard. Controller nodes are responsible for hosting the core services in a Red Hat OpenStack Platform environment, such as the horizon dashboard, the back-end database server, keystone authentication, and High Availability services. A 64-bit processor with support for the Intel 64 or AMD64 CPU extensions. Controller RAM minimum calculation: Use 1.5 GB of memory per core. For example, a machine with 48 cores must have 72 GB of RAM. Controller RAM recommended calculation: Use 3 GB of memory per core. For example, a machine with 48 cores must have 144 GB of RAM. For more information about measuring memory requirements, see Red Hat OpenStack Platform Hardware Requirements for Highly Available Controllers on the Red Hat Customer Portal. A minimum of 2 x 1 Gbps Network Interface Cards. Use additional network interface cards for bonded interfaces or to delegate tagged VLAN traffic. This document focuses only on OpenDaylight installation. Before you can deploy OpenDaylight, you must ensure that you have a working undercloud environment and that the overcloud nodes are connected to the physical network. See Installing the Undercloud and Configuring Basic Overcloud Requirements with the CLI Tools of the Director Installation and Usage guide, which describes the procedures necessary to deploy the undercloud and overcloud. There are several methods to install OpenDaylight in Red Hat OpenStack platform. The following chapter introduces the most useful scenarios of OpenDaylight and how to install them. The recommended approach to installing OpenDaylight is to use the default environment file neutron-opendaylight.yaml and pass it as an argument to the deployment command on the undercloud. This deploys the default installation of OpenDaylight. Other OpenDaylight installation and configuration scenarios are based on this installation method. You can deploy OpenDaylight with various different scenarios by providing specific environment files to the deployment command. The default environment file is neutron-opendaylight.yaml in the /usr/share/openstack-tripleo-heat-templates/environments/services-docker/ directory. This environment file enables or disables services that the OpenDaylight supports. The environment file also defines necessary parameters that the director sets during deployment. Red Hat OpenStack Platform director uses the resource_registry to map resources for a deployment to the corresponding resource definition yaml file. Services are one type of resource that can be mapped. If you want to disable a particular service, set the value OS::Heat::None. In the default file, the OpenDaylightApi and OpenDaylightOvs services are enabled, while default neutron agents are explicitly disabled as OpenDaylight inherits their functionality. Heat parameters are used to configure settings for a deployment with director. You can override their default values with the parameter_defaults section of the environment file. In this example, the NeutronEnableForceMetadata, NeutronMechanismDrivers, and NeutronServicePlugins parameters are set to enable OpenDaylight. The list of other services and their configuration options are provided later in this guide. You can change the default values in the /usr/share/openstack-tripleo-heat-templates/puppet/services/opendaylight-api.yaml file to suit your needs. Do not overwrite the settings in this file directly. Duplicate this file and retain the original as a backup solution. Modify only the duplicate and pass the duplicate to the deployment command. The parameters in the latter environment files override those set in previous environment files. Ensure that you pay attention to the order of the environment files to avoid overwriting parameters accidentally. The login user name for OpenDaylight. The default value is admin. The login password for OpenDaylight. The default value is admin. Enables OpenDaylight to act as the DHCP service. The default value is false. A comma-delimited list of features to boot in OpenDaylight. The default value is [odl-netvirt-openstack, odl-jolokia]. The L7 protocol used for REST access. The default value is http. Defines whether to manage the OpenDaylight repository. The default value is false. The SNAT mechanism to be used by OpenDaylight. Select conntrack or controller. The default value is conntrack. The logging mechanism for OpenDaylight. Select file or console. The default value is file. The password for the OpenDaylight TLS keystore. The default value is opendaylight. Passwords must be at least 6 characters. Enables or disables TLS in the internal network. You can use values true or false. The default value is false. If you enable TLS for services in the internal network, you must use the InternalTLSCAFile parameter to specify the default CA cert. The default value is /etc/ipa/ca.crt. For more information on how to deploy with TLS, see the Advanced Overcloud Customization Guide. You can change the default values in the /usr/share/openstack-tripleo-heat-templates/puppet/services/opendaylight-ovs.yaml file to suit your needs. Do not overwrite the settings in this file directly. Duplicate this file and retain the original as a backup solution. Modify only the duplicate and pass the duplicate to the deployment command. A comma-delimited list of mappings between logical networks and physical interfaces. This setting is required for VLAN deployments. The default value is datacentre:br-ex. The custom username for the OpenDaylight OVS service. The default value is admin. The custom password for the OpenDaylight OVS service. The default value is admin. Defines the allowed tenant network types for this OVS host. They can vary per host or role to constrain the hosts that nova instances and networks are scheduled to. The default value is ['local', 'vlan', 'vxlan', 'gre', 'flat']. Enable or disable DPDK in OVS. The default values is false. The mode for OVS with vhostuser port creation. In client mode, the hypervisor is responsible for creating vhostuser sockets. In server mode, OVS creates them. The default value is client. The directory to use for vhostuser sockets. The default value is /var/run/openvswitch. Enables or disables OVS Hardware Offload. You can use true or false. The default value is false. The OpenDaylight update level. You can use values 1 or 2. The default value is 1. The vhost-user socket directory group. When vhostuser is in the default dpdkvhostuserclient mode, qemu creates the vhost socket. The default value for VhostuserSocketGroup is qemu. The vhost-user socket directory user name. When vhostuser is in the default dpdkvhostuserclient mode, qemu creates the vhost socket. The default value for VhostuserSocketUser is qemu. The OpenStack Compute service allows virtual machines to query metadata associated with them by making a web request to a special address, 169.254.169.254. The OpenStack Networking proxies such requests to the nova-api, even when the requests come from isolated or multiple networks with overlapping IP addresses. The Metadata service uses either the neutron L3 agent router to serve the metadata requests or the DHCP agent instance. Deploying OpenDaylight with the Layer 3 routing plug-in enabled disables the neutron L3 agent. Therefore Metadata must be configured to flow through the DHCP instance, even when a router exists in a tenant network. This functionality is enabled in the default environment file neutron-opendaylight.yaml. To disable it, set the NeutronEnableForceMetadata to false. VM instances have a static host route installed, using the DHCP option 121, for 169.254.169.254/32. With this static route in place, Metadata requests to 169.254.169.254:80 go to the Metadata name server proxy in the DHCP network namespace. The namespace proxy then adds the HTTP headers with the instance’s IP to the request, and connects it to the Metadata agent through the Unix domain socket. The Metadata agent queries neutron for the instance ID that corresponds to the source IP and the network ID and proxies it to the nova Metadata service. The additional HTTP headers are required to maintain isolation between tenants and allow overlapping IP support. In Red Hat OpenStack Platform director, the physical neutron network datacenter is mapped to an OVS bridge called br-ex by default. It is consistently the same with the OpenDaylight integration. If you use the default OpenDaylightProviderMappings and plan to create a flat or VLAN _External network, you have to configure the OVS br-ex bridge in the NIC template for Compute nodes. Since the Layer 3 plug-in uses distributed routing to these nodes, it is not necessary to configure br-ex on the Controller role NIC template any more. The br-ex bridge can be mapped to any network in network isolation, but it is typically mapped to the External network, as shown in the example. With the DPDK, you must create another OVS bridge, typically called br-phy, and provide it with the ovs-dpdk-port. The IP address of the bridge is configured for VXLAN overlay network tunnels. When using network isolation, you do not need to place an IP address, or a default route, in this bridge on Compute nodes. Alternatively, you can configure external network access without using the br-ex bridge. To use this method, you must know the interface name of the overcloud Compute node in advance. For example, if eth3 is the deterministic name of the third interface on the Compute node, then you can use it to specify an interface in the NIC template for the Compute node. This section shows how to deploy OpenDaylight with the standard environment files. Install the undercloud. For more information, see Installing the undercloud. Optionally, create a local registry with the container images that you want to use during the overcloud and OpenDaylight installation. For more information, see Configuring a container image source in the Director installation and usage guide. Log in to the undercloud and load the admin credentials. Create a Docker registry file odl-images.yaml that contains references to the Docker container images that you need for the OpenStack and OpenDaylight installation. You now successfully prepared the environment to deploy overcloud and you are ready to start the installation described in Section 3.2.2, “Install overcloud with OpenDaylight”. Follow the Prepare the OpenDaylight environment files for overcloud procedure to create the necessary environment files for the deployment. To enable DSCP marking with VXLAN encapsulation, include -e /usr/share/openstack/tripleo-heat-templates/environments/odl-dscp-marking-inheritance.yaml in your deploy command. Deploy the overcloud using previously created environment files. Environment files present in the deployment command overwrite environment files that you include earlier in the command. You must pay attention to the order of the environment files that you include to avoid overwriting parameters accidentally. You can override some of the parameters by creating a minimal environment file that sets only the parameters that you want to change and combining it with the default environment files. Installing OpenDaylight in a Custom role results in an isolated OpenDaylightApi service that runs on a designated OpenDaylight node, different from the Controller node. If you want to use a Custom role for OpenDaylight, you must create a role file that contains node layout and function configuration. You can deploy OpenStack with a user-defined list of roles, each role running a user-defined list of services. A role is a group of nodes that contains individual services or configurations. For example, you can create a Controller role that contains the nova API service. You can view example roles in openstack-tripleo-heat-templates. Use these roles to generate a roles_data.yaml file that contains the roles that you want for the overcloud nodes. You can also create custom roles by creating individual files in a directory and use them to generate a new roles_data.yaml. List the default roles that you can use to generate the custom roles_data.yaml file. To create a custom role, create a new role file in the role files directory and generate a new roles_data.yaml file. For each custom role that you create, you must create a new role file. Each custom role file must include the data only for a specific role, and the custom role file name must match the role name. Name: defines the name of the role. The name must always be a non-empty unique string. CountDefault: defines the default number of nodes. If CountDefault: is empty, it defaults to zero. HostnameFormatDefault: defines the format string for a host name. The value is optional. Description: describes and adds information about the role. Copy the default role files into a new directory and keep the original files as a backup. Generate the new role file to use when you deploy the OpenStack overcloud with OpenDaylight in the custom role. Create environment files with links to overcloud container images. For more information, see Preparing the installation of overcloud with OpenDaylight). Prepare the role file to configure OpenDaylight in a custom role (see Create a custom role for OpenDaylight. Create an environment file to map the OpenDaylight node to the flavor and to configure the number of OpenDaylight nodes that you want. You must also create the flavor for the OpenDaylight composable role and tag the ironic node with that flavor. The -r option overrides the role definitions at installation time. Using a custom role requires an extra ironic node that will be used for the custom role during the installation. Install the Overcloud with OpenDaylight in the custom role. For more information, see Install Overcloud with OpenDaylight in custom role). OpenDaylight might be deployed with Compute nodes that support Single Root Input/Output Virtualization (SR-IOV). In this deployment, Compute nodes must operate as dedicated SR-IOV nodes and must not be mixed with nova instances based on OVS. It is possible to deploy both OVS and SR-IOV Compute nodes in a single OpenDaylight deployment. This scenario utilizes a custom SR-IOV Compute role to accomplish this kind of deployment. The SR-IOV deployment requires that you use the neutron SR-IOV agent to configure the virtual functions (VFs). These functions are then passed to the Compute instance directly when it is deployed, and they serve as a network port. The VFs derive from a host NIC on the Compute node, and therefore some information about the host interface is required before you start the deployment. Following the same methodology as shown in Install of OpenDaylight In Custom Role, you must create a custom role for the SR-IOV Compute nodes to allow creation of the SR-IOV based instances, while the default Compute role serves the OVS based nova instances. Remove the NeutronSriovAgent and NeutronSriovHostConfig services from the default Compute role and save the information in the roles_data.yaml. Generate the new role file to use to deploy the OpenStack overcloud with OpenDaylight Compute SR-IOV support. To deploy OpenDaylight with the SR-IOV support, you must override the default parameters in the neutron-opendaylight.yaml file. You can use a standard SR-IOV environment file that resides in /usr/share/openstack-tripleo-heat-templates and the neutron-opendaylight.yaml environment file. However, it is a good practice not to edit the original files. Instead, duplicate the original environment file and modify the parameters in the duplicate file. Alternatively, you can create a new environment file in which you provide only the parameters that you want to change, and use both files for deployment. To deploy the customized OpenDaylight, pass both files to the deployment command. Because newer environment files override any previous settings, you must include them in the deployment command in the correct order. The correct order is neutron-opendaylight.yaml first, and then neutron-opendaylight-sriov.yaml. If you want to deploy OpenDaylight and SR-IOV with the default settings, you can use the neutron-opendaylight-sriov.yaml that is provided by Red Hat. If you need to change or add parameters, make a copy of the default SR-IOV environment file and edit the newly created file. Maps the logical neutron network to a host network interface. This must be specified so that neutron is able to bind the virtual network to a physical port. Prepare the role file to configure OpenDaylight in a custom role with the SR-IOV support (see Prepare the SR-IOV compute role. Run the deployment command with the -r argument to include your custom role file and the necessary environment files to enable the SR-IOV functionality with OpenDaylight. OpenDaylight might be deployed with Open vSwitch Data Plane Development Kit (DPDK) acceleration with director. This deployment offers higher dataplane performance as packets are processed in user space rather than in the kernel. Deploying with OVS-DPDK requires knowledge of the hardware physical layout for each Compute node to take advantage of potential performance gains. consulting the Network Functions Virtualization Planning and Configuration Guide. To deploy OVS-DPDK, use a different environment file. The file will override some of the parameters set by the neutron-opendaylight.yaml environment file in the /usr/share/openstack-tripleo-heat-templates/environments/services-docker directory. Do not modify the original environment file. Instead, create a new environment file that contains the necessary parameters, for example neutron-opendaylight-dpdk.yaml. If you want to deploy OpenDaylight with OVS-DPDK with the default settings, use the default neutron-opendaylight-dpdk.yaml environment file in the /usr/share/openstack-tripleo-heat-templates/environments/services-docker directory. # A Heat environment that can be used to deploy OpenDaylight with L3 DVR and DPDK. #IsolCpusList: ""               # Logical CPUs list to be isolated from the host process (applied via cpu-partitioning tuned). # It is mandatory to provide isolated cpus for tuned to achive optimal performance. #KernelArgs: ""                 # Space separated kernel args to configure hugepage and IOMMU. # Deploying DPDK requires enabling hugepages for the overcloud compute nodes. # It also requires enabling IOMMU when using the VFIO (vfio-pci) OvsDpdkDriverType. # This should be done by configuring parameters via host-config-and-reboot.yaml environment file. ## due to CPU contention of DPDK PMD threads. #OvsDpdkSocketMemory: ""       # Sets the amount of hugepage memory to assign per NUMA node. # "<socket 0 mem MB>,<socket 1 mem MB>", for example: "1024,0". #OvsDpdkDriverType: "vfio-pci" # Ensure the Overcloud NIC to be used for DPDK supports this UIO/PMD driver. # desired number of PMD threads can all play a role in configuring this setting. # These cores should be on the same socket where OvsDpdkSocketMemory is assigned. # threads to be spawned, which may improve dataplane performance. # on the same NUMA node(s) selected for previous settings. You can configure the OVS-DPDK service by changing the values in neutron-opendaylight-dpdk.yaml. Note the amount of RAM for specified is 60 GB for hugepages. It is important to consider the available amount of RAM on Compute nodes when setting this value. Specifies the UIO driver type to use with PMD threads. The DPDK NIC must support the driver specified. Red Hat OpenStack Platform deployments support the driver type vfio-pci. Red Hat OpenStack Platform deployments do not support UIO drivers, including uio_pci_generic and igb_uio. Lists single cores or ranges of cores for PMD threads to be pinned to. The cores specified here should be on the same NUMA node where memory was assigned with the OvsDpdkSocketMemory setting. If hyper-threading is being used, then specify the logical cores that would make up the physical core on the host. Specifies the number of memory channels per socket. Cores to pin nova instances to with libvirtd. For best performance use cores on the same socket where OVS PMD Cores have been pinned to. Create environment files with links to overcloud container images. For more information, see Preparing the installation of overcloud with OpenDaylight. Prepare the role file to configure OpenDaylight in a custom role with the OVS-DPDK support. For more information, see Prepare the OVS-DPDK deployment files. Run the deployment command with the necessary environment files to enable the DPDK functionality with OpenDaylight. This section describes an example configuration of OVS-DPDK with ODL and VXLAN tunnelling. Generate roles_data.yaml for the ComputeOvsDpdk role. 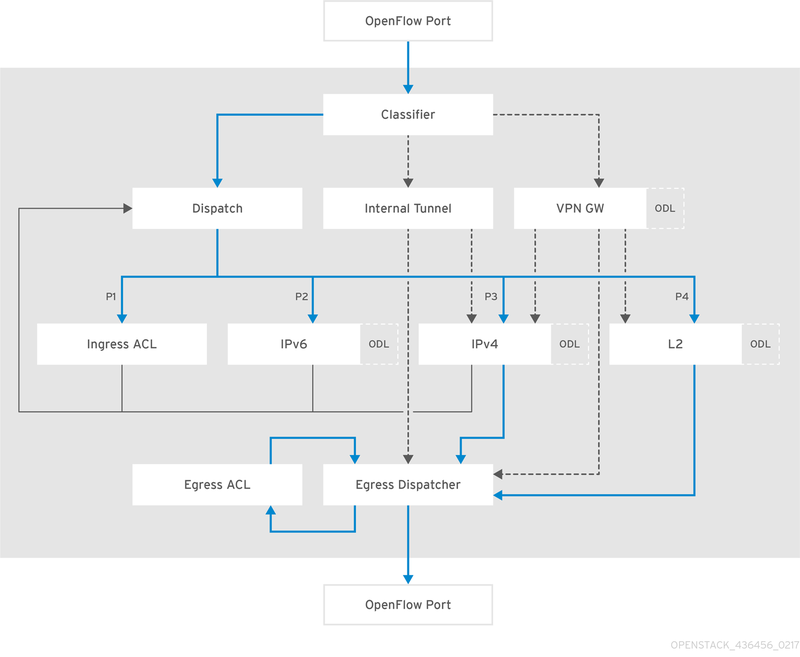 Create the OVS bridge for access to the floating IPs into cloud networks. To include multiple DPDK devices, repeat the type code section for each DPDK device you want to add. When using OVS-DPDK, all bridges on the same Compute node should be of type ovs_user_bridge. The director may accept the configuration, but Red Hat OpenStack Platform does not support mixing ovs_bridge and ovs_user_bridge on the same node. Layer 2 gateway services allow a tenant’s virtual network to be bridged to a physical network. This integration enables users to access resources on a physical server through a layer 2 network connection rather than through a routed layer 3 connection. This means extending the layer 2 broadcast domain instead of going through L3 or Floating IPs. To deploy OpenDaylight with L2GW support, use the neutron-l2gw-opendaylight.yaml file in the /usr/share/openstack-tripleo-heat-templates/environments directory. If you need to change the settings in that file, do not modify the existing file. Instead, create a new copy of the environment file that contains the necessary parameters. If you want to deploy OpenDaylight and L2GW with the default settings, you can use neutron-l2gw-opendaylight.yaml in the /usr/share/openstack-tripleo-heat-templates/environments/services-docker directory. # This file enables L2GW service with OpenDaylight as driver. Comma-separated list of service plugin entrypoints to be loaded from the neutron.service_plugins namespace. Defaults to router. Sets the name of the default interface. Sets the name of the default device. Specifies the service quota for the L2 gateway. Defaults to 10. Specifies the monitoring interval for the L2GW service. Prepare the role file to configure OpenDaylight in a custom role with the L2GW support. For more information, see Prepare the L2GW deployment files. Run the deployment command with the necessary environment files to enable the L2GW functionality with OpenDaylight. The basic test verifies that instances can ping each other. The test also checks the Floating IP SSH access. This example describes how you can perform this test from the undercloud. This procedure requires that you follow a large number of individual steps. For convenience, the procedure is divided into smaller parts. However, you must follow all steps in the following order. In this setup, a flat network is used to create the _External_ network, and _VXLAN_ is used for the _Tenant_ networks. _VLAN External_ networks and _VLAN Tenant_ networks are also supported, depending on the desired deployment. From horizon, you should be able to access the novnc console for an instance. Use the password from overcloudrc to log in to horizon as admin. The default credentials for cirros images are username cirros and password cubswin:). You can also run the command nova console-log <instance id> from the undercloud to verify that the instance receives a DHCP address. Repeat the steps 1 and 2 for all other instances. From one instance, attempt to ping the other instances. This will validate the basic Tenant network connectivity in the overcloud. Verify that you can reach other instances by using a Floating IP. You can test several components of the OpenDaylight configuration and deployment after you deploy OpenDaylight. To test specific parts of the installation, you must follow several procedures. Each procedure is described separately. You must perform the procedures on the overcloud nodes. Choose the required instance and note the instance IP address in the list. To test that OpenDaylight is operating correctly, you must verify that the service is operational and that the specified features are loaded correctly. Log in to the overcloud node running OpenDaylight as a superuser, or to an OpenDaylight node running in a custom role. If there is an x in the third column of the list, as generated during the procedure, then the feature is correctly installed. Verify that the API is operational. This API endpoint is set in /etc/neutron/plugins/ml2/ml2_conf.ini and used by the neutron to communicate with OpenDaylight. Verify that VXLAN tunnels between the nodes are up. To test that the REST API is responding correctly, list the modules that are using it. The output will be similar (the example has been shortened). List the REST streams that use the host internal_API IP. Note the following output to confirm that NetVirt is operational. To validate Open vSwitch, connect to one of the Compute nodes and verify that it is properly configured and connected to OpenDaylight. Connect to one of the Compute nodes in the overcloud as a superuser. List the Open vSwitch settings. Note multiple Managers in the output. In this example, lines 2 and 3 display multiple Managers. Verify that the tcp manager points to the IP of the node where OpenDaylight is running. Verify that the Managers show is_connected: true to ensure that connectivity to OpenDaylight from OVS is established and uses the OVSDB protocol. Verify that each bridge (other than br-int) exists and corresponds to the NIC template used for deployment with the Compute role. Verify that the tcp connection corresponds to the IP where the OpenDaylight service is running. Verify that the bridge br-int shows is_connected: true and that an OpenFlow protocol connection to OpenDaylight is established. OpenDaylight creates the br-int bridge automatically. Connect to a Compute node as a superuser. List the Open vSwitch configuration settings. Read the output. It will be similar to this example. Verify that the value of the other_config option has the correct local_ip set for the local interface that connects to the Tenant network through VXLAN tunnels. Verify that the provider_mappings value under the other_config option matches the value in the OpenDaylightProviderMappings heat template parameter. This configuration maps the neutron logical networks to corresponding physical interfaces. Connect to the superuser account on one of the Controller role nodes. Ensure that the /etc/neutron/neutron.conf file contains service_plugins=odl-router_v2,trunk. On one of the overcloud controllers, verify that neutron agents are running properly. The IP in the plugin.ini, mentioned in step 3, should be the InternalAPI Virtual IP Address (VIP). There is no Open vSwitch agent, nor L3 agent, listed in output of step 5, which is a desired state, as both are now managed by OpenDaylight. OpenDaylight stores logs in containers in the /var/log/containers/opendaylight directory. The most recent log is named karaf.log. OpenDaylight appends incremental numbering to previous logs, for example, karaf.log.1, karaf.log.2. When OpenStack networking commands fail, first examine the neutron logs. You can find the neutron logs in the server.log file on each neutron node in the /var/log/containers/neutron directory. The server.log file also includes errors about the communication with OpenDaylight. If the neutron error originates from interacting with OpenDaylight, you must also examine the OpenDaylight logs to locate the cause of the failure. Log in as superuser to the node where the network error occurs. Display the information about the br-int switch. List the statistics for the br-int switch. In Step 3, note that there are three ports on this OVS node. The first port is a patch port going to the bridge br-ex, which is an External network connectivity port in this scenario. The second port is a tap port, which connects to a DHCP agent instance. We know this because the host is a controller, otherwise on a Compute role it would be an instance. The third port is a VXLAN tunnel port created for the tenant traffic. When you understand what each port is, you can examine the port statistics to verify that the port is receiving/sending traffic (see Step 4). From the output in Step 5, note that each port is receiving (rx pkts) and sending packets (tx pkts). For advanced users who are familiar with OpenFlow, you can examine the flows on the switch to detect where the traffic drops. This output has been edited for length. In this section you explore an example of OpenDaylight installation using OpenStack in a production environment. This scenario uses tunneling (VXLAN) for tenant traffic separation. In this case, the environment files use abstracted numbered interfaces (nic1, nic2) and not the actual device names presented on the host operating system (like eth0 or eno2). The hosts that belong to the same role do not require identical network interface device names. There is no problem if one host uses the em1 and em2 interfaces, while the other uses eno1 and eno2. Each of the NIC is referred to as nic1 and nic2. The abstracted NIC scheme relies only on interfaces that are live and connected. In cases where the hosts have a different number of interfaces, it is sufficient to use the minimal number of interfaces that you need to connect the hosts. For example, if there are four physical interfaces on one host and six on the other, you should only use nic1, nic2, nic3, and nic4 and plug in four cables on both hosts. This scenario uses network isolation to separate the Management, Provisioning, Internal API, Tenant, Public API, and Floating IPs network traffic. This graphic is an example network configuration. It shows custom role deployment. If required, you can also include OpenDaylight in the Red Hat OpenStack Platform conroller. This is the default setup. In this scheme IPMI network, NICs and routing are not shown. You might need additional networks depending on the OpenStack configuration. OpenStack Platform director creates the br-isolated OVS bridge and adds the VLAN interfaces for each network as defined in the network configurations files. The director also creates the br-ex bridge with the relevant network interface attached to it. Ensure that your physical network switches that provide connectivity between the hosts are properly configured to carry those VLAN IDs. You must configure all switch ports facing the hosts as "trunks" with the VLANs. The term "trunk" is used here to describe a port that allows multiple VLAN IDs to traverse through the same port. Configuration guidance for the physical switches is outside the scope of this document. You can use the TenantNetworkVlanID attribute in the network-environment.yaml file to define a VLAN tag for the Tenant network when using VXLAN tunneling. For example, VXLAN tenant traffic transported over a VLAN tagged underlay network. This value can also be empty if the Tenant network is desired to run over the native VLAN. Also note that when using VLAN tenant type networks, VLAN tags other than the value provided for TenantNetworkVlanID can be used. Further, this guide will show the configuration files used in this scenario, their content, and it will also provide explanation on the setting used. The file has only one parameter. These are the mappings that each node, controlled by OpenDaylight, will use. The physical network datacenter will be mapped to the br-ex OVS bridge and the tenant network traffic will be mapped to the br-isolated OVS bridge. This file is located in the /home/stack/baremetal-vlan/ directory. The file path points to customized versions of the configuration files. In this example, the 192.0.5.0/24 subnet for the Provisioning network is used. Note that the physical interface eno2 is used on the undercloud node for provisioning. This is the main file for configuring the network. It is located in the /home/stack/baremetal-vlan/ directory. In the following file, the VLAN IDs and IP subnets are specified for the different networks, as well as the provider mappings. The two files in the nic-configs directory controller.yaml and compute.yaml are used for specifying the network configuration for the Controller and Compute nodes. The number of Controller nodes (3) and Compute nodes (2) is specified in the example. Under the [ml2] section note that VXLAN is used as the networks’ type and so is the opendaylight_v2 mechanism driver. Under [ml2_type_vlan], the same mappings as configured in network-environment.yaml file, should be set. Under [ml2_odl], you should see the configuration accessing the OpenDaylightController. This installation scenario shows an example of OpenStack and OpenDaylight using provider networks instead of tenant networks. An external neutron provider network bridges VM instances to a physical network infrastructure that provides Layer-3 (L3) and other network services. In most cases, provider networks implement Layer-2 (L2) segmentation using the VLAN IDs. A provider network maps to a provider bridge on each Compute node that supports launching VM instances on the provider network. In this case, the environment files use abstracted numbered interfaces (nic1, nic2) and not the actual device names presented on the host operating system, for example, eth0 or eno2. The hosts that belong to the same role do not require identical network interface device names. There is no problem if one host uses the em1 and em2 interfaces, while the other uses eno1 and eno2. Each of the NIC will be referred to as nic1 and nic2. This scenario uses network isolation to separate the Management, Provisioning, Internal API, Tenant, Public API, and Floating IPs network traffic. The OpenStack Platform director creates the br-isolated OVS bridge and adds the VLAN interfaces for each network as defined in the network configurations files. The director also creates the br-ex bridge automatically with the relevant network interface attached to it. Ensure that the physical network switches that provide connectivity between the hosts are properly configured to carry those VLAN IDs. You must configure all switch ports facing the hosts as trunks with the VLANs. The term "trunk" is used here to describe a port that allows multiple VLAN IDs to traverse through the same port. The TenantNetworkVlanID in network-environment.yaml is where a VLAN tag can be defined for Tenant network when using VXLAN tunneling (i.e VXLAN tenant traffic transported over a VLAN tagged underlay network). This value may also be empty if the Tenant network is desired to run over the native VLAN. Also note, that when using VLAN tenant type networks, VLAN tags other than the value provided for TenantNetworkVlanID may be used. This guide also shows the configuration files for this scenario, the configuration file content, and explanatory information about the configuration. These are the mappings that each node, controlled by OpenDaylight, will use. The physical network datacenter is mapped to the br-ex OVS bridge, and the tenant network traffic is mapped to the br-vlan OVS bridge. This file is in the /home/stack/ directory. This example uses the the 192.0.5.0/24 subnet for the Provisioning network. Note that the physical interface eno2 is used on the undercloud node for provisioning. This is the main file for configuring the network. It is located in the /home/stack/baremetal-vlan/ directory. The following file specifies the VLAN IDs and IP subnets for the different networks, and shows the provider mappings. The controller.yaml and compute.yaml files in the nic-configs directory are used to specify the network configuration for the Controller and Compute nodes. Under [ml2_type_vlan], set the same mappings as in the network-environment.yaml file. A security group is a collection of security group rules. Administrators and projects use security groups and security group rules to specify the type of traffic and direction that can pass through a virtual interface port. When a virtual interface port is created in OpenStack Networking, it is associated with a security group. You can add rules to the default security group to modify the behavior on a per-deployment basis. To configure security groups, see Project Security Management in the Users and Identity Management Guide. In OpenStack, each security group is a collection of security rules. Each security rule pertains to ingress or egress traffic. The rules support packet filtering for Layer 3 and Layer 4 traffic. Security groups are associated with ports and you can associate multiple security groups with one port. The NetVirt implementation integrates with OpenStack via Neutron listeners. Netvirt listens for Neutron port change events and security rule events. The security rule events are used to sync the aclservice data store with Neutron security data. The aclservice data model is based on the ietf-access-control-lists YANG model. The security rule flows are programmed on the OVS port create events. If the port-security extension is enabled on the port, the anti-spoofing rules that prevent IP spoofing based on the MAC address of the port, and the security group rules - if any security group is associated - are defined. Stateful implementation of security groups for OpenDaylight uses the netfilter framework. When you select stateful implementation for every port, a default set of rules is added. The Access Control List (ACL) service binds to the ingress and egress dispatcher tables. The ingress pipeline uses information in tables 17, 210, 211, 212, 213, 214, 215, 216, and 217. The ingress dispatcher table. All of the ports that have port security enabled have an entry to match the traffic coming in to the port and send the traffic to table 210. Several services in this table execute in order of priority. ACL services have priority 2. The anti-spoofing filter table. This table ensures that the virtual machine uses the IP-MAC pair associated with the machine. Conntrack-supported traffic table. This table classifies conntrack-supported traffic and sends the traffic to conntrack table 212. Traffic that conntrack does not support is sent directly to the table 214. Metadata is written to classify conntrack (CONST_0) or non-conntrack (CONST_1) traffic. Tracked packet table. The security group flow matches the packets that are in tracked state. When a VM has duplicate flows, the removal of one flow does not affect the existing traffic. In conntrack flows, the flow matches the packets that are in established state. For every new traffic flow, the first packet matches the security group flow and further packets will match the conntrack flow. ACL filter/dispatcher table. This table is common to traffic that conntrack supports and does not support. For conntrack-supported traffic, in an established session, packets return to the dispatcher table without passing through subsequent ACL tables. Packets with an INVALID state are dropped. Flows related to ACL rules are classified into the following categories: Flows for ACL rules that are configured with remote_ip_prefix. Packets that match these flows are sent to table 217. Ports that have single or multiple security groups but all the rules with a common, single, remote security group. 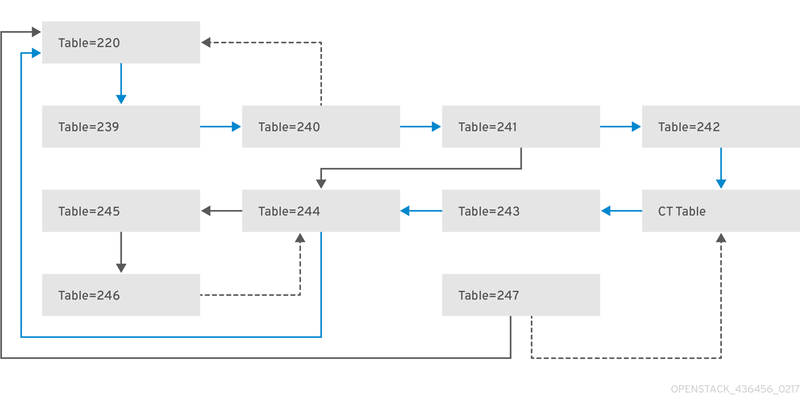 In this case, flows match ACL rules in table 216 and not ACL rules in table 214. Ports with single or multiple security groups with collective ACL rules that have different remote security groups. In this case, flows match ACL rules in table 216 and not ACL rules in the table 214. ACL filter table for ports with single or multiple remote security groups. ACL filters are matched per remote security group in this table. If packets miss a table, they are resubmitted to table 214 to iterate for the next remote security group. The following are some of the cases where ports associated to single or multiple security groups collectively have rules with different remote security groups. Ports that have a single security group (sg1). Ports that have multiple security groups (sg1, sg2, and sg3). Remote ACL filter table. Flows match on remote ACL and corresponding IP addresses. This table is independent of ports. During IP delete scenarios (port delete/update), flows are deleted only when the IP address is not used by any other ports within table 216. This use case demonstrates the necessity to have a looping or iteration-based approach for this table. Use case: Packets that match multiple rules have different remote SGs. This is a case where packets can match both rules (IP and ICMP filters). If it matches src IP (nw_src=10.10.10.4) from remote SG (sg2), tables 215 and 215 must be iterated twice to find the right match. Conntrack and non-conntrack table. Packets that reach this table have passed all of the ACL filters. 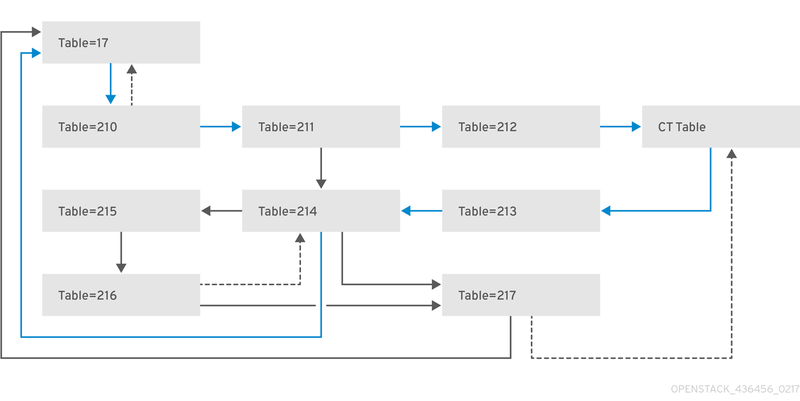 Traffic in table 217 can be both conntrack-supported and non-conntrack-supported. If the traffic is supported by conntrack, the session is committed and resubmitted to the dispatcher. The egress pipeline involves tables 220, 239, 240, 241, 242, 243, 244, 245, 246, and 247. Packet forwarding table. If a port has security enabled, the match in this table leads the packet to table 239. The packets are sent to table 220 when the processing for all services completes in table 239. The anti-spoofing filter table. The anti-spoofing table ensures that the virtual machine uses the IP-MAC pair associated with the machine. Conntrack-supported traffic table. This table classifies traffic that conntrack supports and sends the traffic to table 242. Traffic that conntrack does not support is sent directly to the table 244. Tracked packet table. The security group (SG) flow matches the packets that are in tracked state. When a virtual machine has duplicate flows, the removal of one flow does not affect the existing traffic. In conntrack flow, the flow matches the packets that are in established state. For every new traffic flow, the first packet matches by the security group flow and further packets match the conntrack flow. The ACL filter/dispatcher table. This table is common to traffic that conntrack supports and does not support. For conntrack supported traffic, in an established session, packets return to the dispatcher table without passing through subsequent ACL tables. INVALID packets are dropped. Flows related to ACL rules are classified into three categories as explained here: Flows for ACL rules that are configured with remote_ip_prefix. Packets matching these flows are sent to table 247. Ports that have single or multiple SGs but all the rules with a common, single, remote SG. In this case, flows do not match on ACL rules in this table but instead match ACL rules in table 245. Ports having single or multiple SGs with collective ACL rules having different remote SGs. Flows do not match on ACL rules in this table but instead match ACL rules in table 245. To handle rules that have remote security groups, flows in this table are grouped on a security group basis. Flows for rules with common remote ACL are grouped and matched according to remote security group ID. The ACL filter table for ports that belong to one or more remote security groups. ACL filters are matched per remote SG in this table. If packets miss a table, they are resubmitted to table 244 to iterate for the next remote SG. The following use cases with ports associated to single or multiple SGs collectively have rules with different remote SGs. Port having single SG (sg1). Port having multiple SGs (sg1, sg2 and sg3). The remote ACL filter table. Flows match on remote ACL and corresponding IP addresses. This table is independent of ports. During IP delete scenarios (port delete/update), flows are deleted only when the IP address is not used by any other ports within that ACL. The following use case demonstrates why there is an iteration-based approach for this table. Use case: Packets that match multiple rules have different remote SGs. This is a case where packets can match both rules (IP and ICMP filters). If it matches src IP (nw_src=10.10.10.4) from remote SG (sg2), tables 245 and 246 must be iterated twice to find the right match. Conntrack and non-conntrack table. Packets that reach this table have passed all ACL filters. Traffic can be either conntrack-supported or non-conntrack-supported. For conntrack traffic, an entry is made in the netfilter table and the packet resubmits to the dispatcher. For non-conntrack traffic, packets are resubmitted to the dispatcher. Ensure that the kernel module of OVS is installed correctly. Connection tracking requires that the kernel module is installed. To ensure that the kernel module is installed correctly, check for an entry similar to the following example in /var/log/openvswitch/ovs-vswitchd.log. This log appears when ovs connects to the controller. If the packets drop, refer to the drop rules in tables 212, 214, 217, 242, 244, and 247. If you can determine that acl-service drops the packets, check whether the packets are allowed by acl-service. If acl-service does not allow the packets, add a custom rule to allow the traffic. The OpenDaylight role is composable, so it can be deployed on the same nodes as the neutron nodes, or on separate nodes. The setup is an all-active setup. All nodes can handle requests. If the receiving node cannot handle a request, the node forwards the request to another appropriate node. All nodes maintain synchronisation with each other. In Open vSwitch database schema (OVSDB) Southbound, available Controller nodes share the Open vSwitches, so that a specific node in the cluster handles each switch. Because the Red Hat OpenStack Platform director deploys the OpenDaylight Controller nodes, it has all the information required to configure clustering for OpenDaylight. Each OpenDaylight node requires an akka.conf configuration file that identifies the node role (its name in the cluster) and lists at least some of the other nodes in the cluster, the seed nodes. The nodes also require a module-shards.conf file that defines how data is replicated in the cluster. The Red Hat OpenStack Platform director makes the correct settings based on the selected deployment configuration. The akka.conf file depends on the nodes, while the module-shards.conf file depends on the nodes and the installed datastores (and hence the installed features, which we control to a large extent). These example nodes are seed nodes. They do not need to reflect the current cluster setup as a whole. As long as one of the real nodes in the current cluster is reachable using the list of seed nodes, a starting-up node can join the cluster. In the configuration file, you can use names instead of IP addresses. The cluster is not defined dynamically, which means that it does not adjust automatically. It is not possible to start a new node and connect it to an existing cluster by configuring only the new node. The cluster must be informed about nodes' additions and removals through the cluster administration RPCs. The cluster is a leader/followers model. One of the active nodes is elected as the leader, and the remaining active nodes become followers. The cluster handles persistence according to the Raft consensus-based model. Following this principle, a transaction is only committed if the majority of the nodes in the cluster agree. Lack of communication for less than ten minutes results in the minority nodes reconnecting with the majority leader. All the transactions are rolled back and the majority transactions are replayed. Lack of communication for more than ten minutes results in the minority nodes stopping working and recording the information into log messages. Read-only requests should still complete, but no changes persist and the nodes are not able to re-join the cluster autonomously. This means that users must monitor the nodes. Users must check for availability and cluster synchronisation and restart them if they are out of synchronization for too long. For monitoring the nodes, users can use the Jolokia REST service. For more information, see Monitoring with Jolokia. There are no specific networking requirements to support the cluster, such as bonding or MTUs. The cluster communications do not support high latencies, but latencies on the order of data-centre level are acceptable. Red Hat OpenStack Platform director configures each switch with all of the controllers automatically. The OVSDB supports sharing switches among the cluster nodes, to allow some level of load-balancing. However, each switch contacts all the nodes in the cluster and picks the one that answers first and makes it the master switch by default. This behaviour leads to clustering of the controller assignments when the fastest answering node handles most of the switches. To monitor the status of the cluster, you must enable the Jolokia support in OpenDaylight. The reports are JSON documents. You must change the IP address and the member-1 values to match your environment. The IP address can point to a VIP, if there is no preference in which node will respond. However, addressing specific controllers provides more relevant results. This description must indicate the same leader on each node. You can also monitor the cluster with the Cluster Monitor Tool that is being developed by the upstream OpenDaylight team. You can find it in the OpenDaylight Github repository. The tool is not a part of Red Hat OpenStack Platform 14 and as such is not supported or provided by Red Hat. The clustered nodes will not be able to communicate. When running in clustered mode, each node must have at least one peer. If all traffic is blocked, the controller stops. The switches will not be able to reach the controller. Open vSwitch will not be able to reach the controller. The controller will be able to initiate an active OVS connection, but any pings from the switch to the controller will fail and the switch will finally fail over to another controller. Neutron will not be able to reach the controller. External tools using the REST endpoints will not be able to reach the controller. In this scenario, it only should affect the monitoring tools. On the OpenDaylight side, the logs show only blocked traffic for clustering, because the other ports are used to talk to the ODL controller. The ports that currently are opened via the Red Hat OpenStack Platform director are listed in https://github.com/openstack/tripleo-heat-templates/blob/master/puppet/services/opendaylight-api.yaml#L114. The controller will not be able to push flows. The controller will not be able to reach the switch (the controller will be able to respond to passive OVS connections). 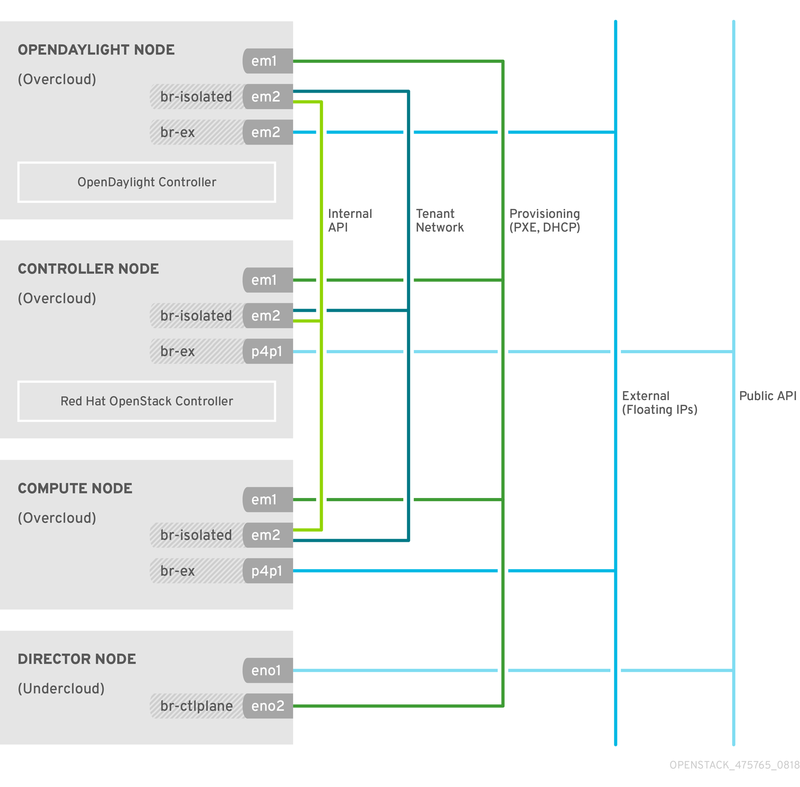 In all cases in the latter situation, because OpenDaylight maintains its configuration and its operational status in distinct trees, the configuration still points to the unreachable devices, and the controller continues to try to connect to them. Neutron to HA Proxy to ODL. PaceMaker manages the VIP (with three backing PIPs). The driver tries to keep TCP sessions open which may have an impact (https://review.openstack.org/#/c/440866/). There are no ODL-initiated communications. 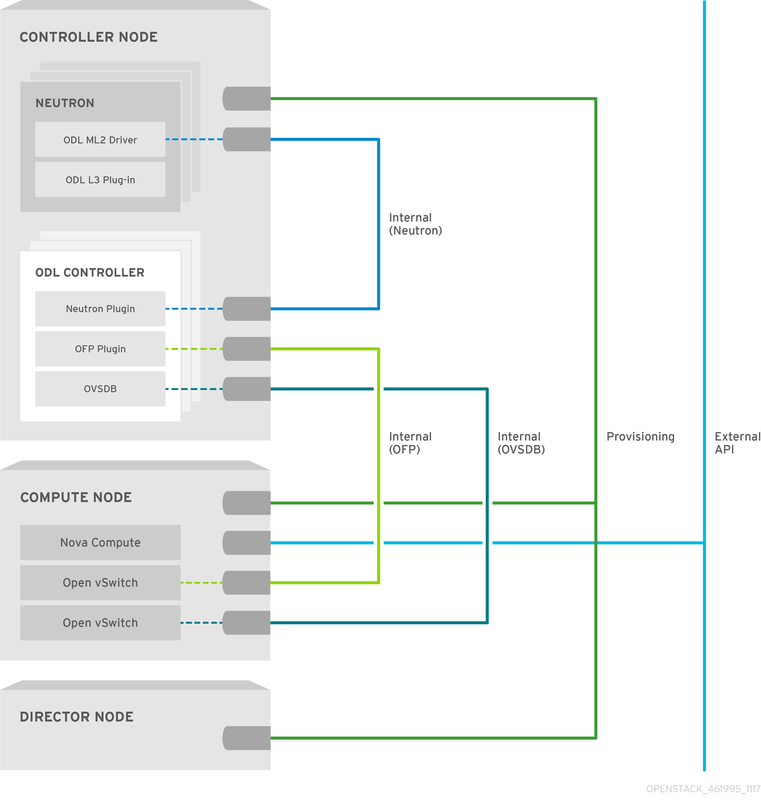 ODL nodes communicate with each other on port 2550 (configurable). ODL communicates with switches using OVSDB (ports 6640 and 6641) and OpenFlow (port 6633). There is no VIP involved, ODL knows every switch’s IP address and each ODL node knows about every switch. ODL communicates with switches using OVSDB (ports 6640 and 6641) and OpenFlow (port 6633). There is no VIP involved, ODL configures every switch so that it knows about all the controllers. Notifications from the switches to the controller are sent to all nodes. The default setup runs the DHCP agent on all neutron nodes, along with the OVS agent. The roles are composable, so the agents can be separated from the controllers. The DHCP agent is important for HA only during the port bringing-up phase and during lease renewal. On port creation, neutron assigns IP and MAC addresses and configures all the DHCP agents appropriately, before the port comes up. During this phase, all DHCP agents answer the resulting DHCP requests. To maximise the dataplane availability in the case of a DHCP agent failure, the leases are configured with long lease times, and the nodes are configured with short renewal delays. Thus, the DHCP agents are seldom needed, but when they are, the requesting nodes will quickly fail an unavailable DHCP agent and issue a broadcast request, picking up any remaining DHCP agent automatically. The agents have their own process monitors. systemd starts the agents, and they create their namespaces and start the processes inside them. If an agent dies, the namespace stays up, systemd restarts the agent without terminating or restarting any other processes (it does not own them). Then the agent re-attaches to the namespace and re-uses it together with all running processes. In the reference implementation, the metadata services run on the controllers, that are combined with the network nodes, in the same namespace as the corresponding DHCP agent. A metadata proxy listens on port 80, and a static route redirects the traffic from the virtual machines to the proxy using the well-known metadata address. The proxy uses a Unix socket to talk to the metadata service, which is on the same node, and the latter talks to nova. With Unix sockets, we do not need to be able to route IP between the proxy and the service, so the metadata service is available even if the node is not routed. HA is handled using keepalive and VRRP elections. Failover time is 2-5s. The agents are handled in the same way as DHCP agents (with systemd and namespaces). The metadata service in Red Hat OpenStack Platform 11 is a custom Python script while in Red Hat OpenStack Platform 14 it is HAProxy, which lowers the memory usage by 30. This is particularly significant because many users run one proxy per router, and hundreds if not thousands of routers per controller. Chapter 9. Where can I find more information about Red Hat OpenStack Platform and OpenDaylight? For further information that is not covered in this document, see the OpenDaylight Carbon documentation. For more information about the Red Hat OpenDaylight and its relation to the Red Hat OpenStack Platform, see the Red Hat OpenDaylight Product Guide. Red Hat OpenStack Platform is supported on Red Hat Enterprise Linux 7.4. For information on installing Red Hat Enterprise Linux, see the corresponding installation guide at Red Hat Enterprise Linux Installation Guide. To install OpenStack components and their dependencies, use the Red Hat OpenStack Platform director. The director uses a basic OpenStack undercloud, which is then used to provision and manage the OpenStack nodes in the final overcloud. Be aware that you will need one extra host machine for the installation of the undercloud, in addition to the environment necessary for the deployed overcloud. For detailed instructions, see Director Installation and Usage. For more details on planning your Red Hat OpenStack Platform deployment with NFV, see Network Functions Virtualization Planning and Configuration Guide.